A few months ago I decided to join the Maymay Made It Stamp of the Month Club. Since doing so I've really enjoyed receiving these stamps but must confess to not using them much. Today I decided it was time to get busy and make a card using the Happy Hibiscus stamp set for May. The first thing I did was cut out four of the sentiment from Oreo cardstock using the Thinking of You Die from Altenew. I layered them together using Art Glitter Glue and set them aside to dry while I stamped the card. The three flower images were stamped using Confetti Cake ink for the base layer and Cookie Monster ink for the lined image. The center of the flowers were stamped using Lemon Meringue ink. The leaves were stamped using Lime Zest ink for the base layer and Peapod ink for the lined layer. These were stamped on a layer of Sugar Cube cardstock which I then attached to a card base of Cookie Monster cardstock, which you can't see but it matches the color of the striations in the flowers. 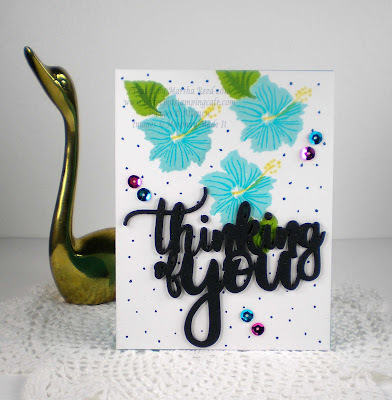 After stamping the leaves and flowers, I took my quilling tool, which has a round ball on the end of it and I tapped it on a Blue Corn ink pad, then tapped it onto the card layer. I kept doing this until I had all of the dots I wanted. Before I added the sentiment, I covered it with a Clear Wink of Stella Brush and it has a wonderful shimmer to it in real life. For the finishing touch I added a few sequins.